Perfect Valentine's Dessert guaranteed to WOW! This Valentine's day, share these ooey gooey pieces of heaven with your partner or devour them all yourself! You don't need to be in a relationship to enjoy these magical bars that are made from whole foods. They are completely guilt-free so you can truly indulge! Don't believe me? Chia is a wonderful plant source of Omega 3's, oats help lower cholesterol, almonds increase overall longevity, dates are the healthiest sweetener, Ceylon cinnamon contains outrageously high levels of antioxidants, and figs are a great source of fiber. 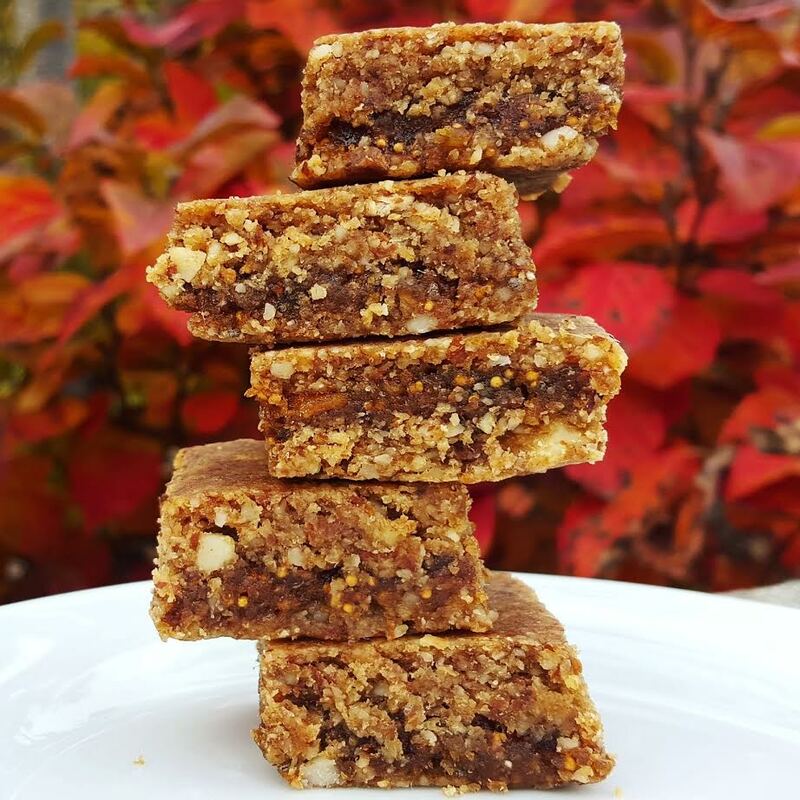 You can now have your Chia Fig Bar and eat it too! Remove the pits from the dates, cover with water, and soak for at least 15 minutes. Soak figs in a separate bowl. While the dates are soaking, blend oats in a high speed blender or food processor until they reach a flour consistency. Add almonds and blend until it becomes a fine powder (some chunks are fine). Place this mixture in a large bowl and set aside. Stir in chai spices and mix until well combined. Blend first 8 dates with 1/4 cup water and vanilla until smooth. Add to the bowl and mix until a dough texture is formed and everything is well mixed. Place in fridge while you prepare the filling. Add soaked figs, remaining dates, and 3 tbsp water to the blender. Blend until a thick paste forms. Place in a separate mixing bowl and stir in Chia Seeds. In a large baking tray with lipped edges, lay parchment paper down. Using the palms of your hands, place chunks of the crust onto the pan and flatten until it is about 1/2 centimeter thick. Fill pan. Cut the mixture down the middle (width wise). Spread the filling on half of the mixture and carefully put the half of the crust that doesn't have the filling on it over the other half. This should create a layer of crust, filling, and then crust. Place in the oven and bake for 15-20 minutes until crust is firm, but still soft. Allow to cool and cut into squares.